Cleaning your windows takes you a too much time and energy? You can change this now – just call our customer care operatives and order our window cleaning in Clerkenwell. We will deal with this matter for you and the final result will be perfect for every part of your windows – glass surfaces, framework and sills. With our help, you will have the freedom to do anything you desire with the time you usually spend for window washing. However, our services will bring you even more, as you can see from our list of advantages. We also provide our professional services in nearby areas: Farringdon, Goswell Road, St Luke's, Smithfield, Aldersgate. You can count on the cleaners for both domestic and business window cleaning. All types of glass surfaces are included in our professional procedures. For instance, you can request a service for cleaning small or double windows, sash ones, French doors, bay windows and patio doors. Besides these, we wash and polish garden window surfaces, conservatories and skylights. At home or at your workplace, you can always have crystal clear glass surfaces – just contact us! We have what it takes and the right methods for the assignment. 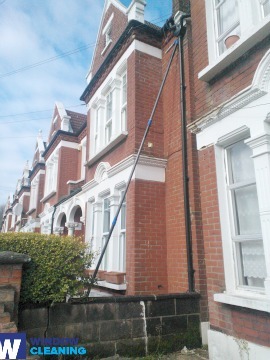 We are happy to use the latest methods to ensure that you have the finest window cleaning. The glass surfaces of your property will look spotless after we utilise water-fed extension pole system and jet washing on them. We use our trucks to supply the poles with water and we can reach up to the fourth floor. In case you need washing of windows on taller buildings than that, we have rope access window cleaners available. Call us on 020 3746 3113 and get in touch with us – these effective procedures will bring you results right away. We guarantee that the windows of your office will be clean and sparkling, like brand-new. Get that by just requesting our commercial window cleaning. For glass surfaces up to the fourth floor, we use water fed extension pole equipment which is absolutely safe and efficient. London is well known-for it's tall buildings. So when it comes to those high-rised windows we will bring our rope access team. With this efficient method, we can give you results surpassing any other! With our quick and effective residential window cleaning in Clerkenwell, you will boost the look of your home immediately. We use purified water for inside and out cleaning of your windows. We make this possible by standing on the ground with the help of water-fed extension pole system, which is safe both for your property and the cleaners. Get more information – get in touch with us on 020 3746 3113 or complete our online booking form. You can also use our chat option. Our assistants are available 24/7 – you will get answers to your questions. You can be one of our content customers today! The nearest tube station serving EC1 Clerkenwell is Farringdon.